Cricket is a game which is heavily influenced by the weather conditions. If there is rain around, the play will be stopped as the ground and pitch conditions take a beating. It happens quite often in the game. Bright and sunny conditions are the most ideal for the play. But have you ever imagined that excessive sun could also stop play? It indeed happened in the Napier ODI between New Zealand and India. The bizarre incident took place during India’s innings. In the pursuit of 158 to win, the visitors were at 43/1 after 10 overs. Indian opener Shikhar Dhawan lined up to face Lockie Ferguson in the 11th over. The pacer delivered a bowl down the leg side that was signaled as a wide. Immediately, Dhawan walked up to the umpire and complained about not being able to spot the ball. At that batting end, the sun was right into the batsman’s eyes. The umpires consulted with each other and agreed to the left-hander. The sun rays were strong enough to make it difficult for the batsmen. Generally, the pitches in most cricket grounds are positioned in a North-South direction to avoid such a situation. But at the McLean Park, Napier, the pitch lies in the East-West direction. As a result, the players were taken off. 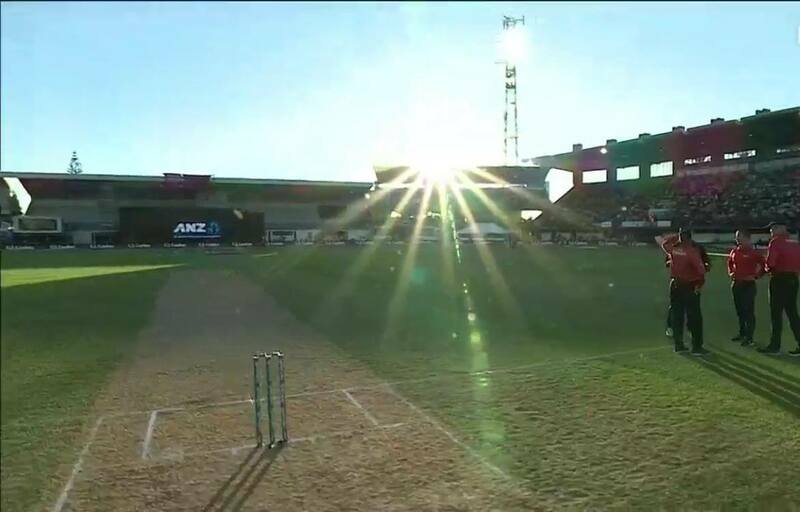 The sun was about to set and the play didn’t resume until the batting end was covered with shadows of the stand. After a delay of about half an hour, the players marched back onto the field. The slight delay caused the Duckworth-Lewis-Stern method to come in. India’s chase was reduced to 49 overs while the target was reduced by a solitary run. In the end, the visitors chased down the target easily with 8 wickets in hand. While Dhawan scored 75, Kuldeep Yadav was the star of the show with 4 wickets while Mohammed Shami, for his 3 wickets up front, won the Man of the Match award. By winning the Napier ODI, India took a 1-0 lead in the 5-match series.